Tag Archive | "CASSA Tri-Hawks U12"
This past weekend (May 19-20) the CASSA Tri-Hawks U12 girls team participated in the Cherry Capital Cup Tournament in Traverse City in the Silver Division and came away winners. The tournament bracket consisted of two pools. The champion from each pool goes onto the championship game. Two games were played on Saturday, where the girls came out with decisive 2-0 wins in both games and against Michigan Fire Juniors and TASC. Sunday started out just as successful with a 4-0 win over Cadillac Crush to set up a championship game with Michigan Legends FC from Brighton. The girls fought hard through a very physical game that was tied at the end of regulation, which leads to two 5-minute overtime periods. 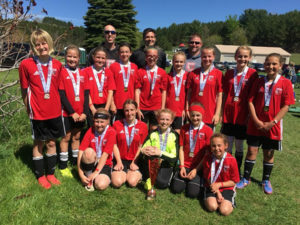 The Tri-Hawks scored early off a corner kick in the first 5-minute session, which led to the eventual final score of 1-0 to take home the championship. To go through four games in a tournament without giving up a single goal is an amazing accomplishment and can’t be done without great teamwork, effort, and soccer ability. The coaches and parents are very proud of this group that have many girls that have played together for 3-plus years from multiple schools in the area and have had continued success against increasing competition to build up to this achievement. We look forward to continue to see these girls on the pitch in the future!